Generates a rich lather for a close and comfortable shave free of razor burn and ingrown hair. It also protects the skin, coats the hair and allows the razor to glide easily. 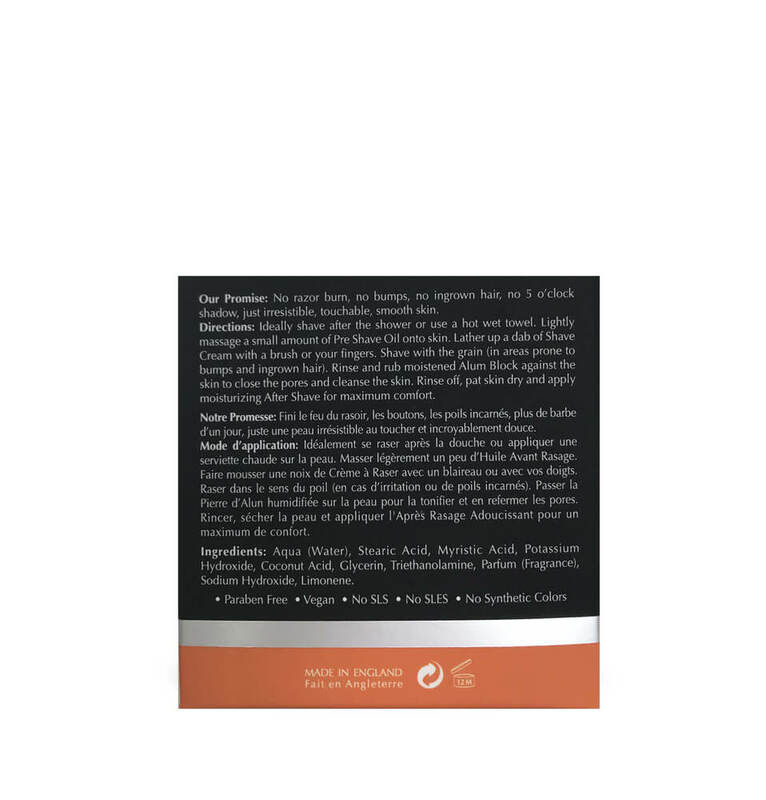 eShave Shaving Cream Orange Sandalwood is Paraben Free, Sulfate Free and Vegan. It contains NO SLS, NO SLES and NO synthetic colors. Our Shaving Cream is made with glycerin and coconut oil to leave the skin smooth and moisturized after shaving. A 4 oz jar will last you many months. It is cheaper and more efficient than foam or gel, and it will give you the closest shave EVER, pain free, no kidding! Shaving Tip: You need a tiny small amount of Shaving Cream to generate a super-rich fluffy lather when using a Shaving Brush. And the more hot water you use the richer the lather. Your shaving creams are great; easy to use and work well with my razor set. I’ve recommended them to many people. Works better than anything else I have used. With the oil and shave cream combo, I’ve had the softest shave ever. Once very stubborn ingrown hairs have disappeared! I love their products. Unbelievable!!!! I was made aware of eShave products by a good friend of mine, and I am NEVER, EVER going back to the plain old store products. This is the best thing to ever happen to my face! A Lot Of Years Shaving; This Is The Best! Truly the best shaving cream on the market. Paired with the pre-shave oil and the after shave cream, I have never had a more professional at-home shave. I have used high end, low end, and mostly mid-range products. This far exceeds any product ever! This, as are all of the shaving creams from Eshave that I have tried, is a very good quality shave cream. I have sensitive skin and i have yet to have ONE bleed while shaving. This was my first ever eShave purchase based on extensive recommendations and promo ads in Men’s Health magazine. I was looking for a series of products to get a closer, less irritating shave. The Orange Sandalwood collection fit the bill perfectly! The scent is just right for Summer and shaving is now more a pleasure than chore. I was so impressed with eShave, I vowed never to go back to drug store brands. This is simply the best a man can get! This shaving cream really works well. My main concern was comfort and non irritating which it provided but after the shave I noticed my skin was super soft! I was visiting my naturopathic doctor and she also commented on how smooth my face looked. So this prompted me to purchase and try out more eshave products such as the scrub, face wash, moisturizer, and after shave cream. I will review these in weeks to come. This is not only a great gift for yourself but a Dad, Brother or a friend. This is my first product with eshave and I am glad that I have found it. I will definitely be buying more. This is by far the best shave cream I have ever used! I ran out of it and went back to edge gel, WOW what a difference, my face was red and irritated and bleeding, just like before. I will make sure that I never run out of eshave again! 1 4 oz shave cream lasted me OVER 6 months! I really love this stuff! This is a great product. gives a great shave, I don’t shave often, about 2x a week, and I’ve used 1 4oz jar in about 2 years. A little goes a looong way. It’s a great christmas gift each year. these creams work better than any OTC foam that I have ever tried. The cream is especialy appreciated when I has several days of stub to remove. The white tea shaving cream has one of the best scents that I have ever experienced in a shaving cream. Amazing! The lime shaving cream is great & leaves my skin much smoother. The cushion provided allows a straight razor to glide effortessly over your skin. One of the most irritation free shaves I have ever had. The best shaving cream I have ever used. I finally can shave my legs and underarms without having any itchy feeling or dry skin right after. I converted most of my male friend s too, and they all got hooked! Since I met Danielle at a market several years ago and she enlightened me on this product, I could not imigine shaving without it. I used to always cut myslef and have those annoying bumps after I shaved but no more. I am a customer forever! Really helped with my shaving. Not only does this shave cream feel and smell wonderful, but its also very potent and only requires the smallest dab to mix a full lather to shave. I have been using e-shave products for years and find each and everyone to exceed expectations. I’ve used both eshave and The Art of Shaving, and I must say that I prefer eshave. It’s foamier, so you don’t have to use as much. Truly, a little dollop goes a long way. I also like the variety of scents eshave offers. It’s truly a high quality product. Ive evolved from CVS brand shaving creme from when I was a younger man, to the Art of shaving and now to eShave. The scents and texture of the eShave products are incredible. The lather they produce is amazing. The resulting shave is the best I have had. I have been shaving for over 20 years and have never really looked forward to it. Now I actually enjoy shaving because I use eShave. I’ve been using these products for many years. I’ve been using the after shave soother, the shaving bowl, and the shave cream for years. Simply the best and since they last so long, are an excellent value.. And the lavender bowl, I’m sorry to report, has lasted over two years! Is the lavender after shave soother still available? I’ve been using eShave products for years. There is not a shaving cream that comes close to eShave. Every once in a while I try something different, and end up throwing it away. Some day I’ll learn!!! Once You Use It, You’Ll Never Use Anything Else Again. I’ve been shaving with a razor my entire life and never realized until I used eshave shaving creams that shaving could actually easy and pleasant. I’ve MEVER cut myself once, even when I was using a razor that should have been retired. The truth is you get a lot more shaves out of your blade and, because of the small amount of cream you need to use, a jar of eshave cream lasts you much longer than any of the over-the-counter shave soaps. So it’s very economical (especially when you consider the price of blades these days. I’ve turned several friends onto eshave and now it’s all they use as well because once you use it, you’ll never use anything else again. I was introduced to this product about 5 or 6 years ago by an excellent salesperson at Neiman Marcus and have been “hooked” ever since! I used to dread shaving each morning because of the way my face felt after I was done. It would be left irritated and often nicked. Now, since I’ve started using eShave’s brushes, along with pre-shave oil & cream, my experience is completely different. My face is no longer left irritated, and the resulting shave is smoother than when I was using conventional spray creams or gels. I’ll never go back. I started using E shave cream on the suggestion of a sales person at Neiman Marcus, about 5 years ago. I have always been on the lookout for the perfect shave cream and I finally found it. I have given the cream as gifts and referred lots of friends. I am just now trying the preshave oil and will give it a trial period. I shave every day of my life. Sometimes twice a day. 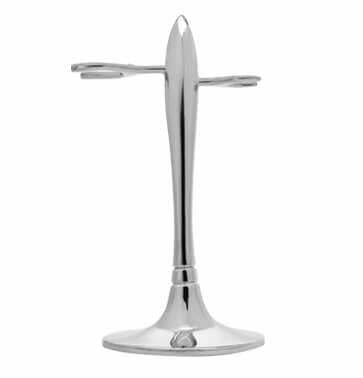 E shave shaving cremes are by far the finest cremes available in the marketplace – bar none. I purchased this as a Christmas gift for my husband. He loves it and will no longer go back to using the shave lotions one can buy from super markets and pharmacies. I met Danielle at a show once and she talked me into trying the shave cream for sensitive skin and now I can’t imagine a shave without it!!! LOVE LOVE IT!!! I love the aroma of this shave cream. Is leaves a nice aroma after shaving that matches well with the after shave. Another amazing aspect of this as well as all eShave Creams is how economical these creams are to use. Just barely touching the brush to the cream provides enough lather to shave and if necessary, to even go over my face a second time. I have been using eShave products for many years and love every scent and every product I have tried. I highly recommend all eShave products. Best Shave I Have Ever Had! I love both the scent and texture. A little goes a long way and doesn’t feel heavy or gum up my razor during shaving. I live in the Arctic Circle so needless to say I have a tough time justifying the expense of mail order shaving products. But E Shave is worth every penny, especially if you have sensitive skin like I do. And my lady is lying if she tells you she doesn’t use it on her legs when I’m out of town. And if anyone knows anything about shaving, it’s definitely her. I have used this for many years and it is simply the best. Great shave, a pleasure to use, slightly scented to please. Very economical as it lasts for months. Do not hesitate to purchase! Also, get the best brush for best results. I have used these shaving creams for several years. There is nothing out there as good. I have used many different shaving creams,just to see if the other shaving creams are equal or better.I have found none! I always end up using the best,e-shave shaving cream.I have used them all,white tea,cucumber,almond[which is my favorite].You can try finding other shaving cream,but e-shave is by far the best.Thank you e-shave! I have used a shaving brush and shaving soap for several years. After getting the shaving cream I am tossing the shaving soap away. A little goes a long way and the shave is excellent. I have tried a few of your products and I am planning to order more as soon as I run out! I have been using the eshave cream for about 6 years, and nothing comes close for the “slick” feeling while shaving. I have gotten other premium shaving creams, gels and foams, and nothing comes close! 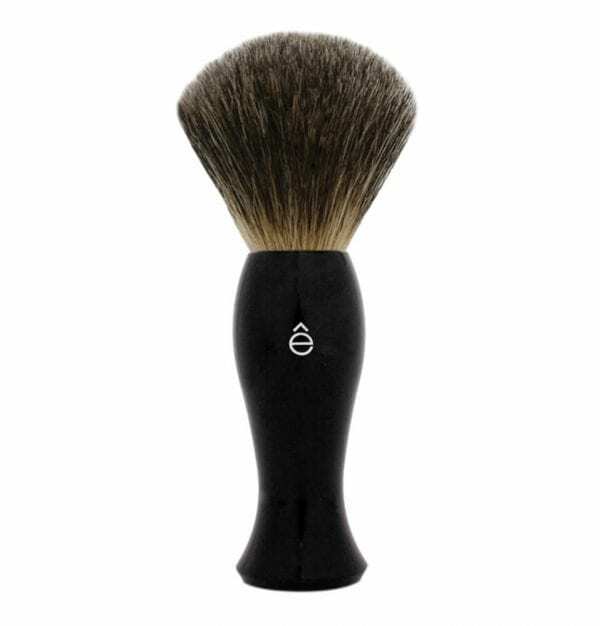 I absolutely get the closest, most comfortable and luxurious shave with e shave. Love the pre shave oil, the shave cream and the after shave soother. This is an awesome combination to make shaving easy and pleasurable. My face feels incredible after shaving. Wow! Smells So Good, You Almost Want To Eat It! Having sensitive skin, I have been a user of Clinique Shave Cream for over 30 years. During our last yearly trip to New York, my wife and I met the wonderful people in the Battery Park eShave store. She purchased the 2 oz almond shave cream. It has replaced my Clinique product. Not only does the eShave last forever, but it actually makes shaving fun – it offers many scent choices and yes, the smells are great! Great stuff, best I have ever tried. great product. overall a great package. shaving is that much more enjoyable. great all-around cream. scent, texture, and ease of applying (with brush or by hand) are all top notch. 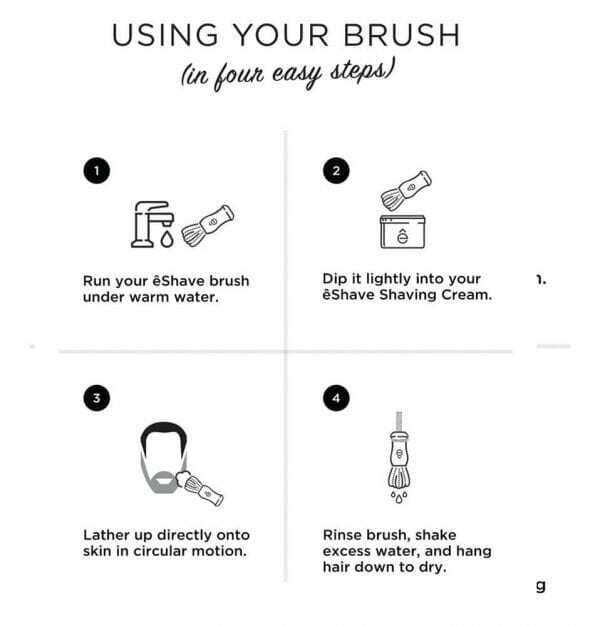 my favorite feature though, is that if you want to refresh the lather while you are shaving, all you have to do is add a touch of water and work the residue (for lack of a better term) that is left on your face back into a nice lather. Fluffy and light, and provides me with a close comfortable shave. EXCELLENT!! Their products are less expensive than “Art of Shaving” (MUCH more expensive-and now owned by Proctor and Gamble) and give better, more comfortable results. I hope they are able to keep it small and artisan run to preserve the quality i have gotten from them (and not sell out)!!! eShave’s Shaving creams create an excellent lather for a close smooth shave. With the eShave brush I don’t know how you can go wrong! Eshave’s shave creams are the best on the market, hands down! eShave shaving cream lubricates your face so the razor can glide over it without getting clogged. I’ve tried it with a Norelco, Panasonic, Gillette Fusion, and my current favorite, a Merkur open comb safety razor. eShave shaving cream works great with all of them, especially the Norelco wet/dry and the Fusion which are so easy to clog. It feels good on the face too and just a little goes a long way. Once you use this, especially with a pre-shave oil, you won’t be able to go back to junk in a can. eshave shaving creams is my go to product when the weather gets warm. I get the smoothest shaves & this stuff smells fantastic. This is the scented shaving cream that I actually enjoy. eShave are the only shaving creams I will use. I’ve tried most others, but none compare. Doesn’t take too much water to get good lather. It also smells like nothing I’ve ever smelled before and has lots of moisturizing properties. Definitely will remain in my rotation for some time. Between the shave oil, cream and my badger brush I no longer suffer the painful scrapes and irritation that has plagued me for so many years. With sensitive skin underneath my barbed wire beard shaving has always been a chore. Not anymore. Thanks eShave! Best shave cream I have ever used. Creamy, rich later and a perfect shave everytime! Been a wet shaver a long time. I love shave soaps but normally shy away from them because it’s a pain to work up a great lather, so I tried eShave shaving cream. This product blew me away. If there were more stars I would add them. The shave was as close as could be, the smell is fantastic, and a touch of the product lathers like I was Frosty The Snowman. Thank you for all the wonderful product you make and for kindly always sending me a little something extra to try. As a cup-and-brush shaver for 45 years, I was doubtful the Shaving Cream would be satisfying. I was sure wrong. Only a “little-finger-nail” of cream on the brush creates a thick foam on my cheeks. Sure is better than the cup. After years or icky shaves and ugly bumps and scrapes – finally a product that makes shaving fun again and the results are super. 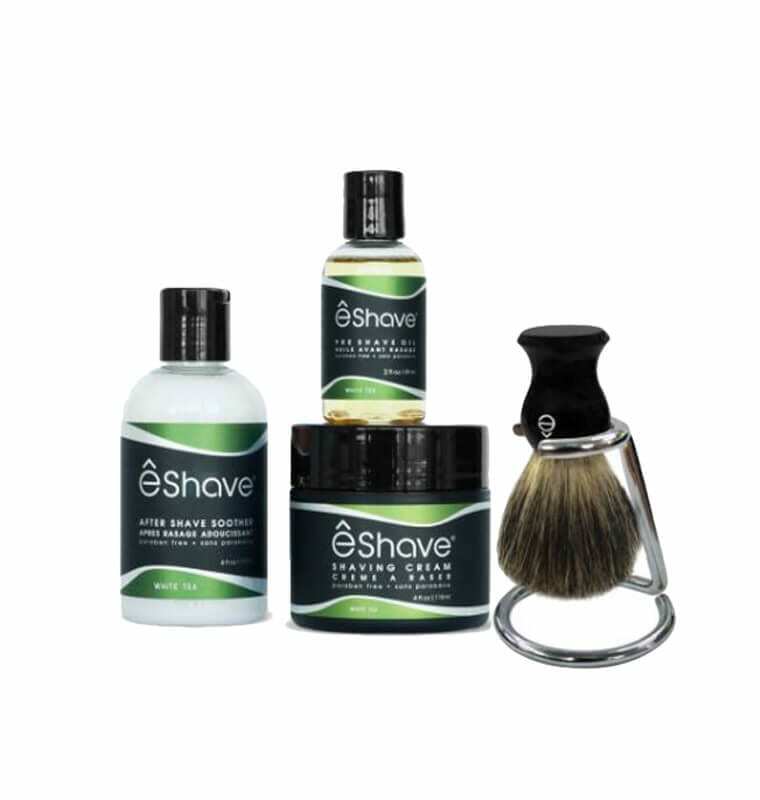 eShave is committed to offering its customers the Best Shave EVER through high quality products and a shaving system that follows the fundamental principles of wet shaving. Clean products: Free of Paraben, Sulfate, SLS, SLES, colors or animal ingredients. Unique Scents and superior quality fragrances; perfume top grade fragrances are used to create discreet yet pleasant scents, combining and layering men’s traditional favorites, such as Orange Sandalwood, Verbena Lime and White Tea to enhance your shaving experience. Artistically designed accessories: unique to eShave and created exclusively for you by our founder Danielle Malka. She personally hand-sculpted each model which is produced in small batches by artisans.